Now that the seven remaining blue poppy plants have been rescued from maple and magnolia roots and given deluxe accommodations in a couple of half-barrels, I thought they should also have protection from excessive winter rain. In their native environments (Tibet and the Himalayas), rainfall distribution is exactly the reverse of Victoria’s — wet during the monsoon season (May through October) and pretty much dry from November through March. Here, the dormant poppy plants are bathed in rains during the winter months, which often results in crown rot and death, even in my sandy soil. The solution? Poppy “pagodas” — charming little roofs on stilts that fit over the half-barrels. They’ll remain in place until next spring, making sure the soil around the precious poppy roots is damp, rather than sopping. If it seems to be drying out, I’ll dribble in a bit of water. After all this fussing to accommodate them, I have great expectations of these plants. We all know where that can go, however, so I’ve reserved a bit of cynicism, just in case. Otherwise, the garden is going through its usual autumn process. I wouldn’t call it “decline,” because I love fall, and because from certain angles, the garden looks better than it did a few weeks ago. Aster “Pink Cloud” living up to its name. Pink nerines finally blooming well. I’ve hung the hummingbird feeder out again. Back in May it became obvious that the hummingbirds were more interested in flower nectar than the sugar water in the feeder (and why not? ), so I removed it for the summer. Now they are visiting again, and this morning a crowd of bushtits showed up. They don’t have the right sort of beaks to use the feeder, but seem to get something from it, so good for them. Dark-eyed juncos are back in town after spending the summer elsewhere, and I’ve heard robins calling in the evenings, a particularly plaintive song that seems right for this time of year. It’s the first full moon of autumn tonight — not to be missed! For years, I had a funky wooden rain barrel, as well as a couple of plastic garbage cans that had been modified into water storage devices. The wooden one was more ornamental than practical, but was a fixture of the place. After new eavestroughs and downspouts were installed, the wooden barrel no longer had a function as a “rain barrel.” For several months it sat there unused, until I decided, coincidentally, to try growing blue poppies (Meconopsis) in containers once more. The soil in my garden is sandy and too full of tree roots for these fussy (but gorgeous) plants. It’s hard to maintain sufficient nutrient levels without also encouraging tree root proliferation. Several years ago, I tried growing blue poppies in 1 and 2 gallon plastic pots, but that attempt resulted in crown rot and failure. So as a last ditch effort, I decided to try really big containers that will have better internal drainage than the plastic pots. Enter the barrel, in the form of two half-barrels. After sawing around the middle, each half was furnished with drainage holes. I positioned the half-barrels in semi-shady spots in the garden, setting them on chunks of concrete and making sure they were more or less level. Then I mixed up what I hope is a suitable growing medium — compost, sand, manure, peat moss, kelp meal, slow-release fertilizer, some actual soil (also known as “dirt”), and a bit of commercial container mix as insurance. The compost and soil are in the bottom parts of the half-barrels, with the other stuff on top. This is to avoid the prolific crop of volunteer seedlings that always sprouts from my compost. Once the soil was in place, I dug up the six surviving Meconopsis plants and removed astonishing mats of maple feeding roots from each root ball. No wonder there have been almost no blooms the last couple of years! The only roots in their new barrel quarters will be their own. I hope they appreciate this by settling in and putting forth some new leaves before going into dormancy. The trick will be overwintering the dormant plants. In their native environment, precipitation is lowest in winter, highest in summer — the opposite of what we have here. Watering containers in summer is easy, but keeping excess rain out of the half-barrels in winter will probably involve some sort of charming roof-like structures that will allow air circulation. Covering with (ugly) plastic sheets, I suspect, would ensure permanent dormancy, otherwise known as death. The pea-gravel mulch is intended to protect the crowns from excessive wetness and fungal evils, but I’m starting to wonder if it’s a good idea. That’s the thing about gardening — you do something that seems like a great idea, but as soon as it’s done, doubts creep in. Trouble is, you have to wait for months to see how things work out. I’m hoping the barrel method will work. It has been done, in a garden just across Juan de Fuca Strait. All or some of the above. 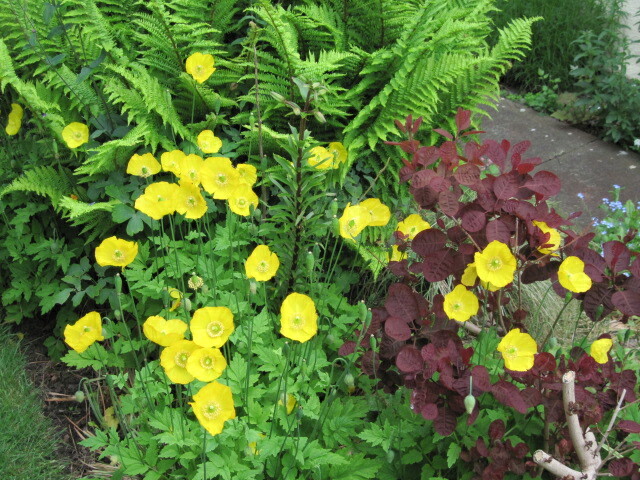 It’s funny — there are plants I take pains to prevent from seeding (Lychnis coronaria), and others I cajole and pray over, hoping they will produce even a few seeds (Meconopsis, of course, but not M. cambrica — that one is in the deadhead a.s.a.p. category). Then there are those with rare or atypical colours — pink, cream-coloured, and tawny California poppies, for example. I can’t resist saving their seeds. Maybe this colour won’t ever appear again, I think; better get ’em while they’re here. So I end up with half a dozen envelopes — California poppies, 2010, 2011, 2013, etc. Eventually, the obvious becomes inescapable — there’s no point in collecting seeds for their own sake. Each seed is a potential plant, but that potential will not be realized inside the seed packet. Soil, water, warmth, time, and luck are necessary before that tomato, delphinium, or poppy grows and blooms in the garden. Unlike wine in the cellar, seeds do not improve with age. There’s no point in hoarding them. 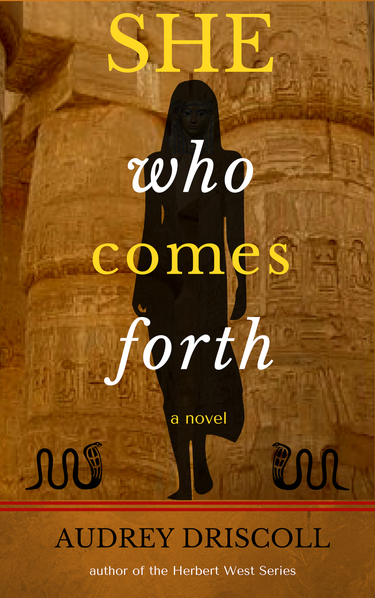 Yes, there’s that story about 3,000-year-old viable seeds from Egyptian tombs, but they’re the exception. Most seeds retain viability for only a few years — perhaps five years at most. Tomatoes appear to be an exception; I successfully grew plants from seeds almost 20 years old. 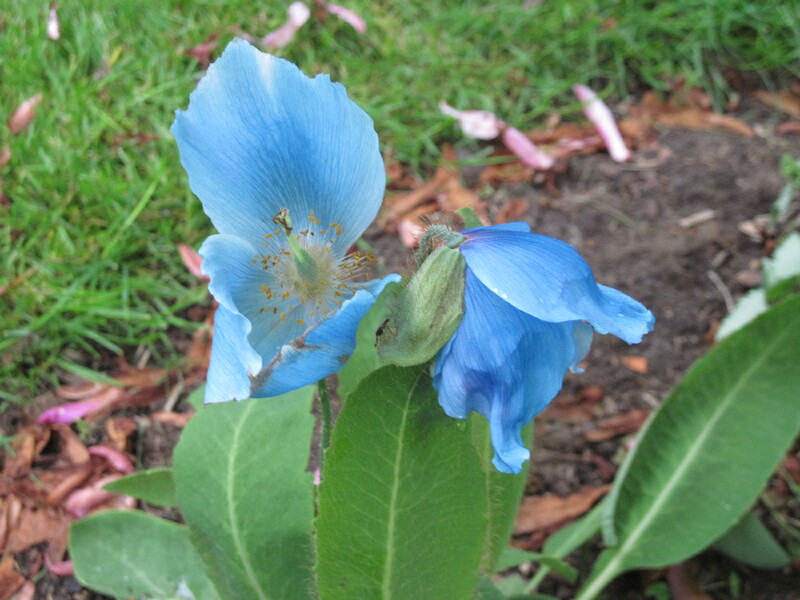 Seeds of the Himalayan blue poppies (Meconopsis), on the other hand, must be sown the winter following harvest. A year later is too late. I’ve grown hundreds, if not thousands of plants from seed. Back when I had a lot of bare earth to cover, I set up a plant factory in my basement — fluorescent lights, a heating cable, lots of suitable containers, and bags of sterile seed-starting soil mix. I made “paper pots” using a clever wooden device called a Potmaker to roll and fold newspaper into pot-like shapes two inches in diameter and about four inches tall. Packed together in a wooden or plastic flat, these “pots” lasted long enough to nurture annual seedlings until they were ready for life in the garden, at which point pot and all could be planted. Much cheaper than peat pots, and a “green” option as well. Growing some plants from seed is dead easy; others are long-term projects often doomed to failure. Some seeds need exposure to freezing temperatures to induce germination. Others (Romneya coulteri, the California tree poppy, for example) germinate best after fires — not easy to do at home. Then there’s double dormancy, which may require two years before a sprout is seen. Many gardeners give up before that happens, or simply forget what’s supposed to happen in that pot and repurpose it. Working with challenging seeds requires dedication, labels, record-keeping, and space, as well as a good supply of patience. The emergence of sprouts is always a thrill, no matter how long it takes, and especially if it takes a long time. A few years ago, I managed to sprout four seeds of Lilium columbianum, a native yellow lily. As I recall it, the sprouts emerged the second spring after planting. They went dormant for the summer, at which point I thought they had died, but last spring two tiny plants appeared. (I guess the other two decided to stay permanently dormant). One of the two survivors was cut down by slugs (probably a single slug, actually, because the plant was less than an inch tall). The other persisted for a couple more months, then vanished. Dead or dormant? Imagine what a thrill it was to see a lily-like sprout emerge last week, and a second one today! If I manage to foil the slugs, it’s possible I’ll actually have two plants taller than one inch by summertime, and who knows — maybe in a couple of years I’ll see at least one of them bloom. And if it produces seeds, I can do the whole process again — if I’m up to the effort. As for all the old seeds I have stashed away in envelopes, pill bottles and other containers, the best thing would be to sort through them and get rid of any that are more than five years old. They don’t have a future, except as sad mementos of plants that have vanished, or that never progressed beyond the seed stage. As a last-ditch effort in some cases, I could do germination tests — spread a sample of seeds between layers of dampened paper towels and see if anything happens. Unlike other unwanted items, disposal of old seeds is easy — mix them up and cast them to the winds. If any of them manage to sprout, I’ll consider it a gift from the garden gods. 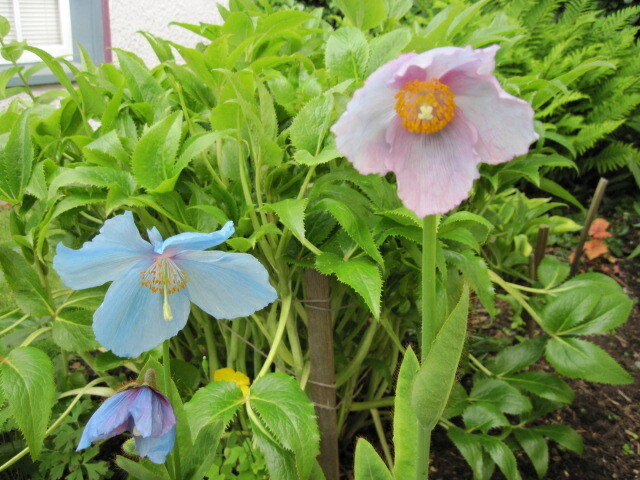 I have often grumbled about the difficulties of growing blue poppies (Meconopsis species). Over the past 20 years I have grown numbers of plants from seed obtained from two plants I bought — Meconopsis betonicifolia and Meconopsis x sheldonii ‘Lingholm.’ Most of my plants now are seedlings of Lingholm; all traces of M. betonicifolia have vanished from my place. On two occasions in those 20 years I have had spectacular success (in a relative sense, of course) with my blue poppies. In May 2000 I had seven plants blooming well in a small rectangular bed. I did not take any pictures, expecting a repeat performance. Ha. In 2013, after working hard at producing more seedlings and preparing a bed for them near a large magnolia, I had 7 or 8 plants in bloom, This time I did take pictures, but because the bed was long and skinny — crescent-shaped, in fact — the effect was not as wonderful as when the flowers were massed together in a smaller space. This year, I have one plant in bloom. Only one, but I have made sure to take pictures of both blooms. This was the first one. As it faded, the second bud began to open. Fully open, it proved to be a much better flower than its predecessor. That colour! The ethereal texture of the petals! Definitely worth the trouble. I hope to obtain some seeds from these two flowers, to plant next January or February. I took this as a challenge, a kind of Olympics of the gardening endeavour. I would grow blue poppies from seed. I ordered some from Thompson & Morgan, and failed. That was when I lived in Saskatchewan and gardened on clay soil, so it was probably just as well. 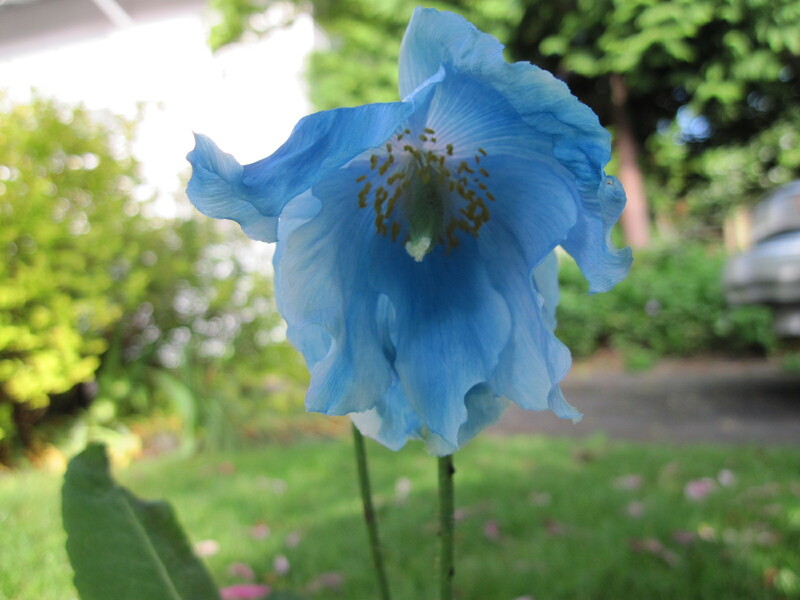 After I moved to Victoria, B.C., things had changed — you could buy plants of Meconopsis betonicifolia. I acquired one and saw it bloom. It produced seeds. When I tried again with those, I got results. Spectacular results. In the summer of 2001 I had about ten plants blooming vigorously in a little bed I had fussily prepared just for them. Unfortunately, I didn’t take any pictures, because I expected them to bloom again the following year. Ha. The fussily prepared bed was close to an Ailanthus, the Tree of Heaven. Need I say more? From these experiences and some reading, I have learned the following about growing blue poppies: Only the freshest seeds will germinate. (I have described my method in another post). The plants are apt to die after blooming — not immediately, but unless they develop little offsets, don’t expect to see them the following spring. Even in good conditions, they are often short-lived. And they have no tolerance for tree roots. A year or two later, I acquired another Meconopsis — a variety called ‘Lingholm,’ which apparently is a sort of botanical freak, a fertile hybrid arising from a sterile one when its chromosomes were somehow doubled. Don’t ask me any more about this, but you can find out more here. Its origins aside, ‘Lingholm’ is lovely — more vigorous than M. betonicifolia and its seeds germinate more readily. And in my experience, its colour is a purer blue than that of M. betonicifolia, which often has tints of muddy mauve. My next experiment, begun several years ago, was to grow blue poppies in pots. I produced a batch of seedlings (seeds mostly from ‘Lingholm’ but some from M. betonicifolia) and in late summer planted each one into a gallon sized or slightly smaller pot, in a nice, peaty soil mix. No tree roots, easy to maintain moisture — how could this fail? Well, it hasn’t, but it it has not been a screaming success either. The trick is to get the plants through the winter. Their natural habitat, I understand, is alpine, with relatively dry conditions in winter (under snow). Good drainage is, of course, essential, but it appears that in pots it is hard to achieve. I keep the pots close to the house wall in winter but even so, losses are common — the plants begin to grow, then succumb to wilt and rot. The other problem is that they are not eager to bloom in pots, at least not those of the size I have used. It’s possible that they would do better in larger containers. I did have three plants of M. betonicifolia that grew and bloomed quite happily for a couple of years in a large ceramic pot. I have plans to provide better containers for the plants (seedlings and others) I have on hand now. I am also trying to find a suitable spot for another blue poppy bed — not easy in a garden as crowded as mine. This spring two of my pot-grown specimens bloomed. The seeds came from my purchased plant of ‘Lingholm,’ but in the case of one specimen at least, the family resemblance isn’t quite there. A distinctly pink tinge has crept into the blue. Who knows what might be going on in those chromosomes? Maybe there were genetic contributions from M. betonicifolia. It will be interesting to see what colours other seed-grown plants might produce — yet another incentive to induce bloom, aside from the sad fact that these plants aren’t terribly interesting when not in bloom. In addition to the children of ‘Lingholm,’ I do still have a couple of plants of M. betonicifolia descended from my original plant. (One great feature of these poppies is that if you can get them to bloom they produce seeds in abundance). They are both in pots and one obviously has plans to bloom in the next couple of weeks. So the experiment continues. 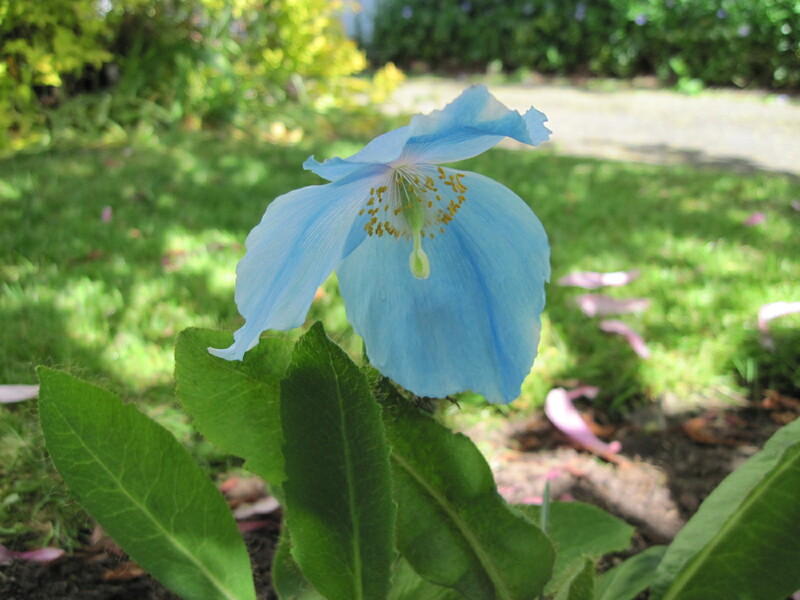 Finally, I’ll mention a Meconopsis that is utterly easy to grow. Once you have it you have it forever, without any effort at all. The effort that’s needed is to control or get rid of it, because it’s actually a sort of weed, similar to toadflax, campion and all those other tough plants. It’s Meconopsis cambrica — not blue, but a bright cheery yellow (with the occasional orange specimen). It does combine well with dark reds or purples, as here with Cotinus ‘Royal Purple.’ I have it in abundance. Too bad it isn’t blue. 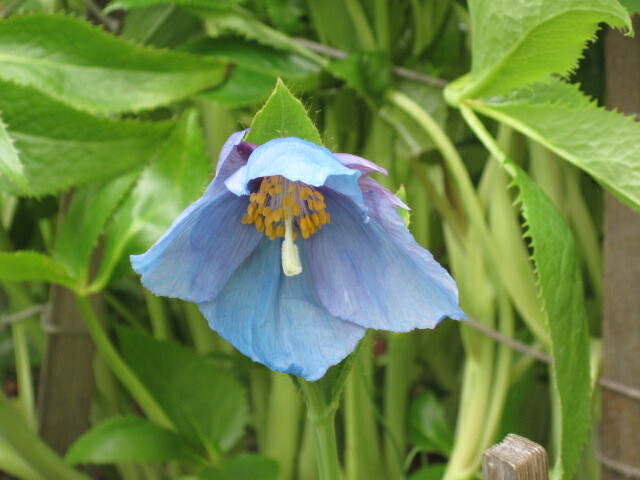 This is the right time of year to think about growing the Himalayan blue poppy, genus Meconopsis, if you want success with it from seed. Eleanor Perenyi, whose book of garden essays, Green Thoughts, is one of my favourites, confessed to a total failure in her attempts to grow Meconopsis from seed. I can say with considerable pride that I have achieved success, not once, but several times. I think one of the secrets is to use absolutely fresh seed — no older than 6 months after harvest — which means that most commercially available seed is too old by the time it reaches the hopeful gardener’s hands. I purchased a plant of M. betonicifolia in the late ’90s. It bloomed and set seed, which I gathered and seeded early in 2000. I ended up with ten or so young plants, which I set out that autumn into a fussily prepared bed under an Ailanthus (“tree of heaven” — ha!). In the summer of 2001 they bloomed gorgeously — a pool of heavenly blue.With typical gardener’s hubris, I expected repeat performances over the years, so didn’t bother to take pictures. The following spring only a few plants emerged from what was by then a root-infested bed. Blue poppies are notoriously sensitive to root competition. The struggling survivors succumbed over the summer, and that was that. Since then, I have had a measure of success by growing these plants in less rooty situations and in pots, but never again have I had the alluring mass of bloom (if you can consider a 3′ x4′ patch a “mass”) as in 2001. Last summer, in fact, was a bust — only a couple of wretched little blooms on my potted specimens, probably because I hadn’t bothered to add fresh compost to the pots. Blue poppies demand slavish attention from their gardeners. Without it, they die in true prima donna fashion. Anyway, for what it’s worth, here is my method for growing Meconopsis from seed. First, get fresh seed, either from a plant you have bought or from a fellow gardener. The seeds are ready to gather by late August or early September. Preserve them in cool, dry conditions until the following January or February. To achieve germination, two things are needed — fluctuating temperatures and light. Because you will be subjecting them to outdoor conditions, use durable, shallow (2-3″ deep) vessels with drainage holes. I use plastic honey containers with lots of little holes punched into the bottoms. Containers that come with translucent lids are especially good. Use a commercial seed-starting mix, dampened and firmed into the containers. Tamp it down and smooth it with some sort of suitable implement, such as a flat-bottomed glass. Scatter the seeds carefully over the surface, trying to space them evenly. The trick is to achieve a balance between too many, which will result in overcrowding, and too few. You have to allow for a certain amount of germination failures and seedling deaths. Don’t cover the seeds with the soil mix; they need light to germinate. Set the seed containers into an inch or so of water until the surface is wet, then allow them to drain and place in a warm spot, such as the top of a hot water tank or refrigerator. It’s probably a good idea to cover the containers with a sheet of plastic at this point. Leave them in the warm spot for a week or 10 days, then move to a sheltered outdoor spot. I put my seed pots next to the foundation on the north side of the house. At this stage, put the lids on your containers, if you have lids. Otherwise, enclose each container in its own plastic bag, making sure that the bag doesn’t sag down onto the soil surface (check for this after rain). The idea is that they will be exposed to temperatures that occasionally dip below freezing over a period of two months or so — January through March here on Vancouver Island. By April you should see seedlings emerging! At this point, damping-off is your worst enemy. Remove the covers from the pots, at least partially. You don’t want them to dry out, but you don’t want fungus-producing conditions to prevail. Air circulation is essential. Once the seedlings are big enough to handle (carefully!) transplant them to individual 4″ pots, using a humus-rich, well-draining soil mix. In early fall, transplant the young plants to their permanent spots, in root-free, well-drained soil amended with lots of compost, and a situation that gets morning sun but is shaded in the hottest parts of the day. A disclaimer — this method works in the temperate Pacific Northwest, where winter low temperatures rarely exceed -5 degrees C (23 F). In truly frigid climates, something else is called for. The idea is to expose your seed pots to fluctuating temperatures that cross the freezing point several times. There is a lovely little book about Meconopsis by Bill Terry, who grows a number of species with much more success than anything I have managed on my rooty little patch. The title is Blue Heaven. Even though it’s a small book, it has many illustrations to whet the reader’s appetite for these fascinating plants. The cover absolutely radiates blueness. I will be fussing over my plants, potted and otherwise, hoping that they will bloom better this summer than last, and that I will get seeds to plant next winter. With blue poppies, it’s wise always to have a few new plants coming on to replace those that expire all too easily. Nicola Furlong, a fellow Smashwords author and WordPress blogger here on Vancouver Island, is also an aficionado of the blue poppy. Both she and I will post photographs of success on our blogs.